In any commercial endeavor, ensuring that goods reach their destination on time is a central component of the company’s success as a whole. 3PL Center provides excellent local NY NJ PA delivery to give our clients the commercial edge in any industry. Looking for Local NY NJ PA Delivery Services? Local NY NJ PA delivery services refer to the delivery of goods or commodities within the New York, New Jersey and Pennsylvania localities. 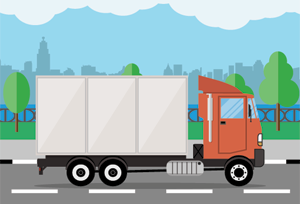 If you have business interests in NY, NJ and PA, efficient local delivery services are necessary to ensure that goods reach your intended destinations on time. On the surface, this might seem like a simple proposition, but in reality, the process requires a lot of advance planning as well as the technical know-how to handle various types of commodities. Also, the complexity of delivery varies from project to project. When you use 3PL Center’s local delivery services, you can rest assured that all these complexities will be easily dealt with, all without inflating your delivery costs. Why Should You Choose 3PL Center for Local NY NJ PA Delivery Services? The benefits of using 3PL Center for local NY NJ PA delivery services manifest when you consider our business philosophy. Our aim is to ensure that fulfillment and transportation services are made as easy as possible for our clients, all without affecting the cost they have to pay for it. This might sound like a tall order for competitors, but we have honed our skills over the years to become one of the best in the industry. This is why even major players in the ecommerce industry such as Amazon are our customers. To live up to expectations, we at 3PL Center continue to do as much as we can to keep simplifying fulfilment and logistics service provision while offering first class service. One of the results of this is our advanced inventory and shipping system, which we keep updating from time to time to keep it effective. Our class-leading shipping and inventory system ensures that even the most complex orders are handled as required, and that our customers are always in the loop. For instance, clients can easily keep track of goods on transit with ease. 3PL Center is also highly capable of providing specialized logistics solutions for local NY NJ PA delivery. An example of this is fast delivery, necessary for transportation of some classes of commodities such as foods and some pharmaceuticals. Whatever your transport needs are and whatever challenges there are in transporting, you can be sure that 3PL Center will come up with a method to ensure that they are delivered on time and on budget. Ready to Experience the Best in Local NY NJ PA Delivery Services? For more information on our local delivery services, don’t hesitate to give us a call at 732-391-2500 or email us at sales@3plcenter.comtoday.